One of DC's iconic couples! Aquaman and Mera star in this stunning limited edition statue. Designed by Patrick Gleason and sculpted by Dave Cortes! It measures about 16 1/3-inches tall. One of DC's iconic couples stars in this DC Comics Designer Series Aquaman and Mera by Pat Gleason Statue. 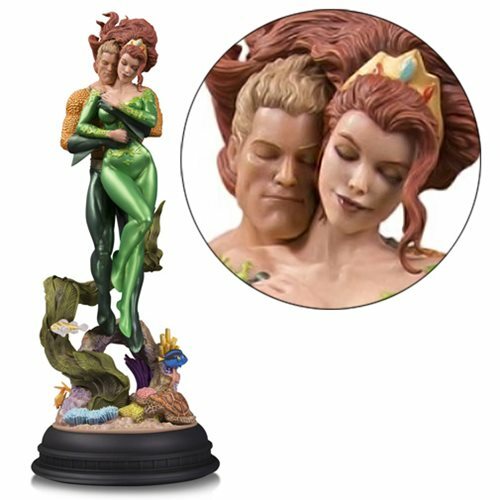 Designed by Patrick Gleason and sculpted by Dave Cortes, this stunning statue of the King of the Seven Seas and Mera beautifully captures their love on a base where they're surrounded by underwater life. A limited edition of 5,000 pieces, it measures about 16 1/3-inches tall and comes packaged in closed box.